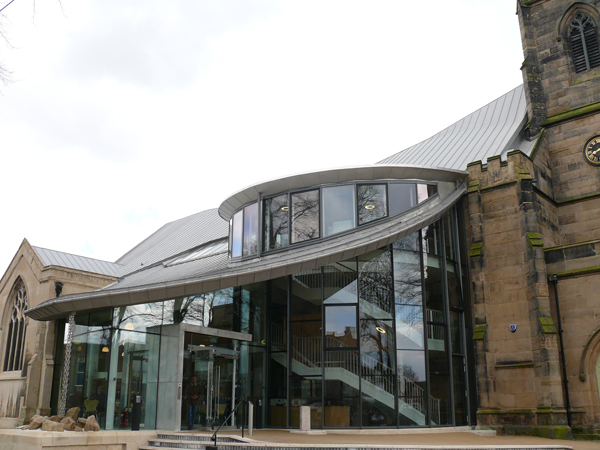 For the £5m restoration of Grade II-listed St Barnabas Church in Erdington architects Brownhill Hayward Brown specified a standing seam system across the entire roof span using Aperam UGINOX Top stainless steel. This takes on the matt grey appearance and traditional aesthetic of aged lead sheet through natural patination and is approved by English Heritage for use where there is a continuing risk of metal theft. The church had been destroyed by fire in late 2007 as a result of an arson attack, with only the tower and perimeter walls left standing. The award winning design provides a sweeping stainless steel roof which ‘fuses’ a modern glass-fronted extension with the extensively restored Victorian structure. This provides a modern twist in the creation of a place of worship fit for the 21st century and a prime example of how modern architecture and good conservation practice can be integrated into a historically important ecclesiastical setting.